Physical characteristics: Puffins have a very distinctive large, yellow and orange bill with a blue-gray base. Their faces are white to gray with a thick black band from the forehead back. Their backs are black and their bellies white. Their legs and feet are orange. 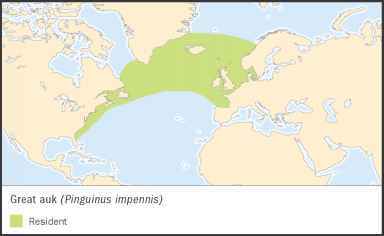 Geographic range: Puffins breed on seashore areas of North America and Europe. They spend the winter in the waters of the North Atlantic. Habitat: Puffins inhabit rocky seashore areas and islands during the breeding season. They spend the winter at sea. Diet: Puffins primarily eat fish. When feeding young, adults are known to carry dozens of fish back at a time in their large bills. Behavior and reproduction: Puffins are strong fliers and spend most of their time at sea, except during the breeding season. At sea, puffins may be found in flocks with other species such as murres and razorbills. Puffins also mate at sea. Courtship, behavior that leads to mating, involves the male and female tapping their bills together. Puffins build nests at the end of long burrows which they dig in the ground. The female lays a single egg. 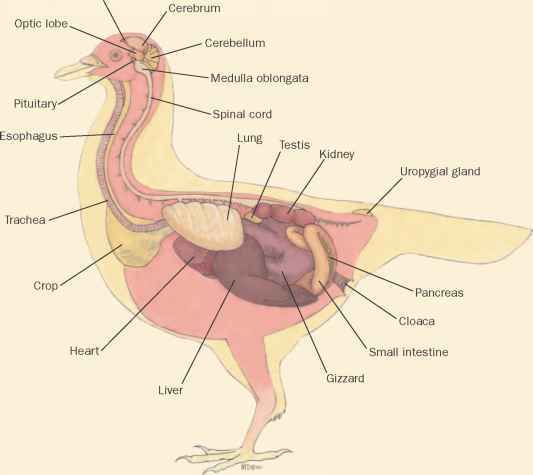 The chick hatches with a thick coat of down and is able to leave the nest after thirty-six to forty-seven days. 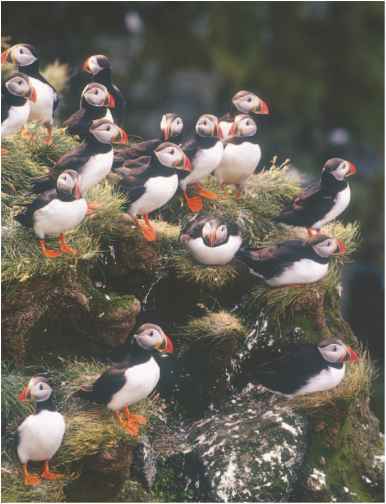 Puffins and people: No significant interactions between puffins and people are known.